The cinema strike in Kerala has been called off and theatres are set to become active again. Here is a closer look at the two releases that will hit the theatres on November 10. Director Jeethu Joseph, who directed Detective and Mummy & Me, is ready with My Boss, starring Dileep and Mamta Mohandas in the lead. Jeethu Joseph explains the story line: "Priya (Mamta Mohandas) is a fiery boss in a software firm in Mumbai, who is too strict about discipline and deadlines. "Manu (Dileep) has just joined as her assistant. She was born and brought up in Australia, while he is an engineering graduate from a village in Alappuzha," says Jeethu. "The film talks about the tussle between the two cultures. She is in need of his help at a particular point of time and he makes use of the situation to benefit his own career. "It has all been shown in a humorous way. Later in the story, Priya goes with Manu to his home in Alappuzha." Dileep eplains his character, "My character Manu is ambitious and he will do virtually anything to retain it. "As we often see around us, there are certain people who will have everything in their life but will end up chasing their own silly dreams. For him, going abroad is his big dream." Mamta says she can relate to her character to a great extent as she was born and brought up abroad. "My character's perceptions about almost everything in life changes during the course of the film, which is quite interesting," says Mamta. Sai Kumar, Seetha, Kalabhavan Shajon and Valsala Menon are also in the film. Master Jeevan, who was the naughty young boy in Mummy & Me, acts in this film too. My Boss is produced by East Coast Vijayan. The cinematographer is Anil Nair and the music director is Sejo John. Director M Mohanan, whose earlier films are Kadha Parayumbol and Manikyakkallu, is hoping to do a hat-trick of hits with his latest film, 916. Anoop Menon, Asif Ali and Mukesh play the lead roles. 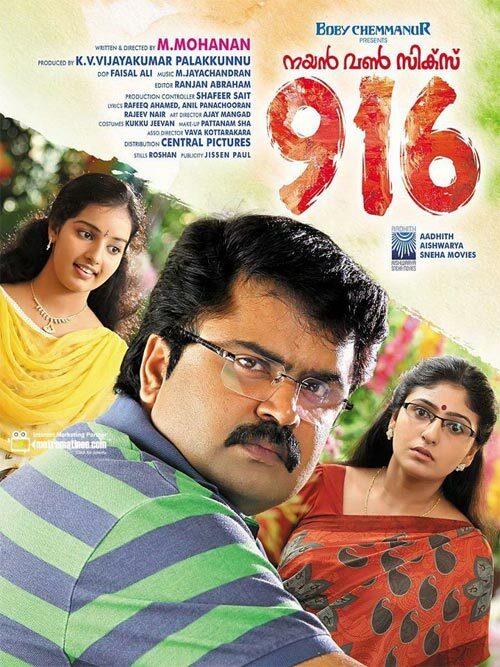 916 is produced by K V Vijayakumar Palakkunnu. The cinematographer is Faisal Ali and the music director is M Jayachandran. PIX: Lisa Haydon's HOTTEST magazine covers!